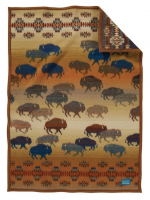 The bison, often referred to as the buffalo, is the largest land mammal in North America. 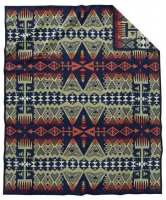 The Chief Joseph blanket is the oldest on-going blanket produced by Pendleton Woolen Mills. Its design is balanced with arrowheads symbolizing bravery and pointing in all directions of Mother Earth. 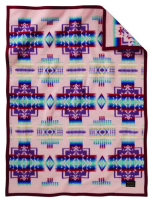 The dynamic, intricate design is inspired by the Cheyenne Arrow Renewal ceremony, which sought to strengthen the collective existence of this Great Plains tribe. 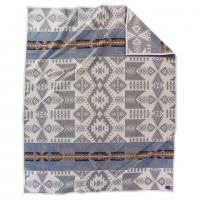 Silver Bark Blanket Inspired by a classic Pendleton design from the 1920s.